He reckoned inconsistent results are due to players taking it easy in training and being content not to push themselves hard. The former Bolton Wanderers player was Reds’ scorer during their 3-1 defeat at Colchester United on Saturday, their third successive away-day defeat. Morais 32, told the club’s website www.crawleytownfc.com: “Successful teams they win again and they win again. “It’s something we are striving to do, but we’re winning one, losing one. “It’s about pushing yourself to the limit each day; you’ve got to keep working hard and keep improving. “It’s a mentality I feel, it’s a ruthlessness in your mind and it’s got to be relentless. “You are getting a win but in a worst-case scenario you are getting a point. “If you cruise through training, if you chill now and again, you’ll win one, lose one, you may feel happy and you think it’s OK but you’ll never achieve anything in your career and there will be no promotions. “The reality is if you want to be successful, you’ve got to make sacrifices. Morais slammed Bondz N’Gala for getting sent-off at the end of the defeat at Colchester. Reds have been drawn at home in the second round of the Parafix Sussex Senior Cup. 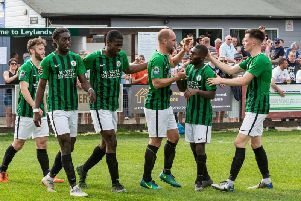 They will entertain the newly-promoted Bostik League South East Division club Haywards Heath Town at Broadfield Stadium. Heath are in their first season in the Bostik League South East Division, after winning promotion last season. A date for the fixture will be confirmed as soon as possible. Crawley Town midfielder David Sesay has given his boss the big thumbs-up. The ex-Watford player reckons the strength in depth at Crawley can only help the head coach and the team. Sesay, 20, said: “We’ve got really good players and everyone’s pushing for places, everyone’s at it, everyone’s going hard. “That makes a recipe for success, you can’t just walk into a team. I’m really positive. He said: “Every manager is different - our gaffer is really good, he’s come in during the season, which isn’t easy to do. “He’s doing really well. We’ve produced results and his mentality in training is really at it, at it 100 per cent. Reds are back at home this Saturday when they host third-placed Newport County. The Exiles are unbeaten in their last five league matches, their latest result being Saturday’s 2-1 win against Stevenage. Reds will be without defender Bondz N’Gala who is starting a three-match ban after getting sent-off against Colchester. Crawley will then be at home again on Tuesday night when they face another in-form team, Exeter City who are second.